NOTE: This game has been released as freeware. Apogee Software, Ltd. retains copyright on this title. The information here is provided only for historical purposes. No support is given on this title. 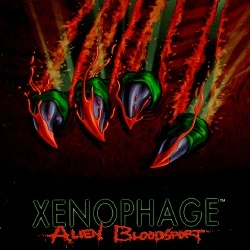 Xenophage is a fighting game in the same genre as Mortal Kombat. This game features scrolling arenas that also zoom in and out, depending on how far apart the fighters are from each other. This is a unique feature in fighting games. The fighters all come from unique alien planets, so they look very cool and unusual. It's up to you to figure out their special abilities and moves. 8 characters, 2 champions, and a nasty surprise. High resolution (SVGA) 640x480 mode for much greater detail. The fully rendered foes are the largest, most detailed characters even seen in a fighting game, nearly as tall as the entire screen. Innovative panoramic screen panning, zooming and real-time scaling, shadows and special effects. Interactive, animated environments, with special dangers! Special moves, combos, resurrections, and humiliations. Story mode, Free Play mode, and Training mode. The Blood Flow Meter lets you adjust the gore. Flesh ripping, blood sucking, claw slashing, tail whipping, karate kicking, fist ramming, body slamming, blood spurting action - need we say more? Originally released December 29, 1995. Click on any of these screenshot thumbnails for a larger image. One 4 button joystick (such as Gravis Gamepad) or up to two 2 button joysticks.